Hay fashion friends!!! I don’t know about you but I am looking forward to new spring scarves, however, it can be hard to know how to wear a scarf in the spring and really, do we have to buy brand new scarves to have for the spring? Grab a feminine, springy-colored top, your favorite boyfriend jeans, some coordinating sneakers and accessories and you’re good to go! All you need to do is grab some coordinating springy shoes, your favorite pair of skinnies (I suggest white or pastel to fit the spring feel you’re going for), a coordinating, loose-fit top and some simple accessories and viola! Pastels are key this spring and this outfits proves it solidly. Actually this outfit incorporates SO many of the hottest spring trends this season (Shelby will be sharing what those are later on) but grab a pastel top, a floral skater skirt that coordinates with your favorite silk scarf, throw on your favorite booties from this winter (make sure all of the salt is cleaned off of them) and there you have it! Add some tights or a cardigan to warm this one up a bit if you need to. And finally, the tasseled silk scarf! 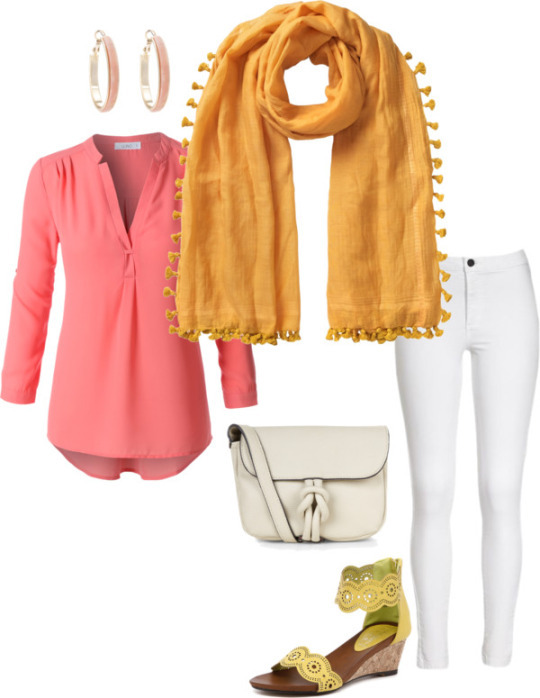 Grab a pastel dress, a complimentary jacket, your tasseled scarf, booties and simple accessories and you’re good to go! How about it, did I find something from your closet or spark a few new springy ideas for your upcoming spring wardrobe? Oh I love your choice of scarves, especially the last two! I am currently weaving a gradient purple scarf that will be ready just in time for spring! That sounds beautiful! I’m finding I love purple more and more! I love scarves so much. So much!! Light, breezy scarves. Heavy, warm knit scarves. I just love them all. They really bring outfits together and be so versatile!